» Is the L.A. City Council Fiddling While Rome Burns? Is the L.A. City Council Fiddling While Rome Burns? Despite the fact that more than 50 applications for new digital billboards are pending in the city building department, the six-month moratorium on new billboards and conversions of conventional billboards to electronic approved by the City Planning Commission on Nov. 13 hasn’t even been scheduled for a city council committee hearing. 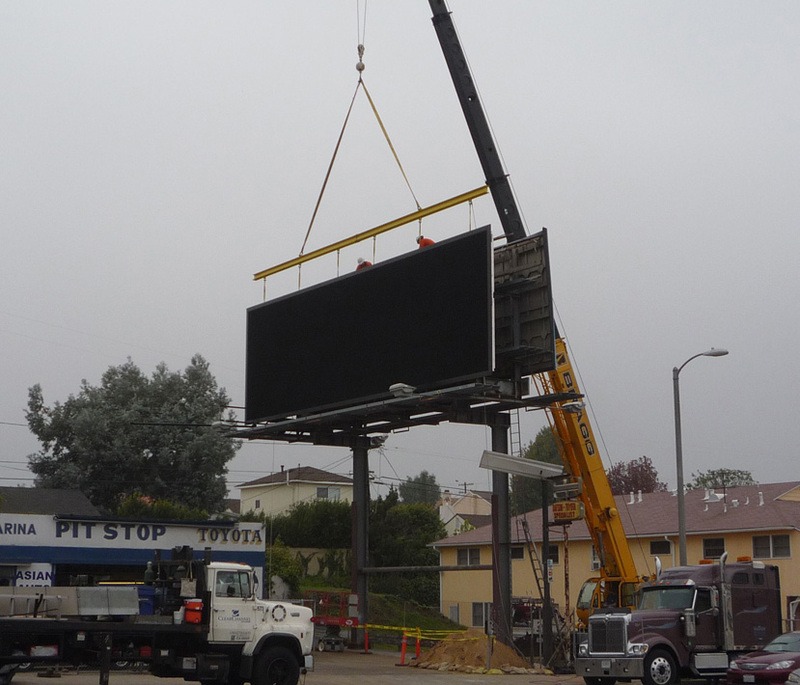 New Digital Billboard Being Erected On Lincoln Blvd. in Westchester on December 2. The Interim Control Ordinance (ICO) establishing the moratorium was transmitted to the council’s Planning and Land Use Management (PLUM) committee on Nov. 25. That committee, chaired by Councilman Ed Reyes, didn’t take up the ICO at its Dec. 2 meeting, nor is it on the agenda of the next meeting, Dec. 9. No further meetings are on the city calendar before the council recesses for the holidays. The ICO would stop the issuing of permits to Clear Channel, CBS Outdoor and Regency Outdoor to “modernize” a total of 877 existing billboards by converting them to digital technology with millions of LED lights and messages that change as rapidly as every 8 seconds. The billboards have provoked a storm of complaints from residents in a wide area of the city affected by the intense light, and concerned about their possible effect on traffic and pedestrian safety by distracting drivers. A building department official reported to the PLUM committee at the Dec. 2 meeting that 101 permits for digital billboard conversions had been issued, and that another 51 applications for permits were pending. The ICO would not stop conversions where permits have already been issued, but would halt the issuing of any new permits if final approval hadn’t been given The official, Hector Buitrago, chief of code enforcement, said 85 digital billboards already converted had been given final inspection. Read the complete text of the Billboard Moratorium ICO.